Application: These drip-less bottom loading couplers are a proven performer at major oil terminals worldwide. This coupler mates with all 4" bottom loading adaptors built in accordance with API RP-1004 requirements to significantly reduce liquid loss at disconnect. Its unique design ensures easy alignment, tight connection and resists side forces during loading. 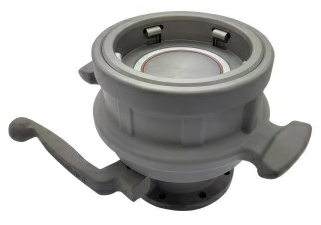 This coupler is rated for 75 psi and is available in 4" only. ●The coupler is used widely and with the special design gasket to resist low temperature, damage and light fuel. When the coupler is in the non-working condition, it will be lock itself to avoid the wrong operation. 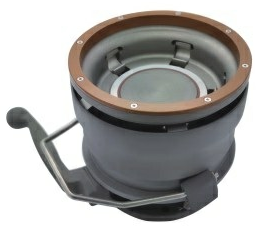 Ensures the tight connection with the valve at the bottom of the tanker and efficiently protect from the side forces. ●Special sealing design structure, avoid danger of sealing gasket rushing out when quick filling. All the aluminum parts are hard anodized, all the other connecting parts are stainless steel with the superior, reliable quality, and long working life.